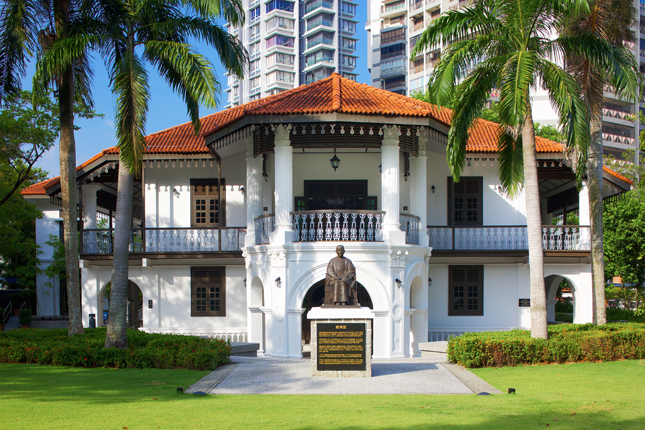 Sun Yat Sen Nanyang Memorial Hall is one of the few surviving examples of villas that were once common sights in British Singapore. As its name clearly suggests, the building is strongly linked to the Chinese revolutionary Sun Yat Sen (孙中山). Moreover, it serves as a reminder of the contributions of Chinese pioneers and their historic connection to the 1911 Chinese Revolution (辛亥革命). Boey Chuan Poh (梅春辅 or 梅泉宝), a wealthy Chinese merchant, built the spacious villa in 1902 on a land parcel that had been part of a sugar plantation owned by Joseph Balestier, the first American Consul appointed to Singapore, and called it Bin Chan House (明珍庐). In 1905, Teo Eng Hock (张永福), a Teochew businessman and uncle of the rubber magnate Lim Nee Soon (林义顺), bought the villa as a retirement home for his mother. He renamed it Wan Qing Yuan (晩晴园), which remains a popular moniker for the estate today. Sun Yat Sen was a Chinese revolutionary who was instrumental in overthrowing the Qing dynasty to establish a Chinese republic in 1912. Fondly remembered as the first Chinese president, Sun founded the Republic of China upon his Three Principles of the People (三民主义): nationalism (民族主义), democracy (民权主义), and welfare (民生主义). In July 1905, Sun became acquainted with Teo Eng Hock, Lim Nee Soon, and Hokkien merchant Tan Chor Lam (陈楚南) in Singapore when he was en route to Europe from Japan. In April the following year, he came to Singapore. After consulting with his mother, Teo invited Sun to stay at Wan Qing Yuan. In the subsequent years, Sun frequented Nanyang (南洋, or Southeast Asia) to garner support from the locals for his planned revolution against the Qing imperial government. Sun made Wan Qing Yuan his residence and operational base whenever he visited Singapore. It was in the villa that he established the Singapore branch of Tongmenghui (同盟会, or Chinese Revolutionary Alliance) in 1906. Wan Qing Yuan became Sun’s headquarters in Nanyang for the propagation of his revolutionary ideas and the coordination of various activities in the region. Three uprisings in Qing China to overthrow the Manchu government – Huanggang Uprising (黄冈起义, May 1907), Zhennanguan Uprising (镇南关起义, December 1907), and Hekou Uprising (河口起义, April 1908) – were devised and launched at the villa. The building had also welcomed fellow revolutionaries and prominent leaders of modern China from the region, such as Wang Jingwei (汪精卫), Hu Hanmin (胡汉民), and Huang Xing (黄兴). In addition, Sun also made four designs of the ‘Blue Sky, White Sun, and Wholly Red Earth’ (青天白日满地红) flag at Wan Qing Yuan, and had even requested Teo’s wife to embroider the designs. With the support of Chinese communities around the world, including those in Singapore who laboured zealously and contributed generously to the revolutionary cause, Sun’s movement finally succeeded in toppling the Qing government in 1911. Sun passed away in 1925. After Teo sold off Wan Qing Yuan in 1910, the villa changed ownership several times. Six Chinese community leaders – Lee Kong Chian (李光前), Tan Ean Kiam (陈延谦), Chew Hean Swee (周献瑞), Lee Chin Tian (李振殿), Lee Choon Seng (李俊承), and Yeo Kiat Tiow (杨吉兆) – collectively purchased the estate in 1937 and donated it to the Singapore Chinese Chamber of Commerce (known as the Singapore Chinese Chamber of Commerce and Industry today) the following year. In 1940, the Nanjing Government of the Republic of China granted funds for the renovation of Wan Qing Yuan to transform it into a memorial hall dedicated to Sun. When the Japanese invaded Singapore, the Japanese military took over the estate and used it as a communication base. After the war, Kuomintang (国民党, Nationalist Government of China) contributed to the restoration of the villa and founded an overseas political branch at Wan Qing Yuan. The branch was subsequently prohibited by the British Administration in 1949. Wan Qing Yuan was returned to the Singapore Chinese Chamber of Commerce and refurbished once again, before it was reopened in 1966 as Sun Yat Sen Villa. A typical colonial villa in Singapore, Sun Yat Sen Nanyang Memorial Hall is well adapted to the tropical climate of the region. Verandahs on both sides of the villa act as buffers between the walls and the scorching sunrays, while large windows ensured ample air ventilation before the advent of air-conditioning. Above the projecting porte-cochere (carriage porch) was a sitting area for the residents, which is now a spacious open room supported by stately Corinthian columns. Lining the perimeters of the upper floor are cast-iron railings with an intricate design, while the roof eaves are adorned with filigree fascia. The villa is situated in a beautiful compound. Besides lush greenery, two bronze statues of Sun Yat Sen – one seated and the other standing – can be found in the garden. There is also a long bronze wall mural that depicts scenes from early twentieth-century Singapore. Wan Qing Yuan was renamed Sun Yat Sen Nanyang Memorial Hall in 1997. After the National Heritage Board took over the management of the former residence in 2009, the estate underwent yet another phase of development. It was reopened to the public on the centenary anniversary of the 1911 Chinese Revolution in 2011. Sun Yat Sen Nanyang Memorial Hall seeks to present to its visitors the 1911 Chinese Revolution from the perspectives of Chinese communities living in Singapore and Nanyang.